Kansas City is located in Wyandotte County and is also the county seat. It is the third largest city in the state of Kansas and in the Kansas City metropolitan area. Kansas City has a population of about 150,000 residents in the area. This is known as the “Unified Government” because it is part of a consolidated city-county government. 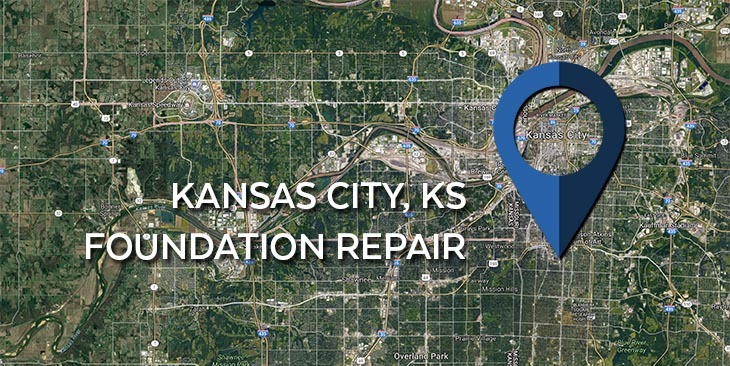 KC Pro proudly serves those in need of foundation repair and in the surrounding areas to ensure a safe living environment. This city was started in 1868 and finally incorporated in 1872. Kansas City had their first election for mayor that year and they elected Mayor James Boyle. Since the city had a force of five men, Kansas City was proclaimed a second class city in the year of 1880. Kansas City was one of the nation’s 100 largest cities until 1960. If you notice you’re having foundation problems in your home such as cracks, leaning walls or chimneys, or sinking foundation, then please call us! We can solve your foundation issues. For foundation repair services in Kansas City and the surrounding areas, we will fix your home so it’s safe and sound. Are you noticing cracks in your basement walls? Are your walls starting to bow or lean? Do you have garage column cracks? You may notice your home is leaning to one side. If you answered yes, then your home may need foundation repairs. Foundation repairs can be a result of soil-related disturbances from poor compaction, overloading, excessive organic materials that expand/shrink with changes in the moisture content of the soil. Unfortunately, these conditions can slowly destroy the foundation and structure of your home. At K.C. Pro we are here to help. We can repair your foundation with ECP solutions. We can correct imbalances within your home’s structure and straighten your bowing walls. Our ECP solutions include helical piers, steel piers, helical tieback anchors, plate anchors, and hydraulic lift slab piers. It is important to note that while many home repair projects are “Do it Yourself” foundation repair should not. The foundation is too important to the well being of your home, it should be handled by a professional. When you call KC Pro a qualified and trained structural engineer will come to your property and take the necessary measurements and use a laser level to determine precisely how much your home has settled. From there, our crew will know the best solution for you. If you have questions about your property, then call KC Pro for a free estimate. We are a reliable foundation repair service provider. When there is a heavy rainfall, do you have basement leaks? Are you starting to notice cracks at the base of the walls? At KC Pro we specialize in basement and crawl space waterproofing in the Kansas City Metropolitan area. If you don’t waterproof your basement or crawl space, you could face expensive water damages. Over time, wet basements can cause bowing walls and cracked floors. Damp crawl spaces can invite mold, insects, and be a bacterial hazard. This can also produce poor indoor air quality throughout your home. We can take care of all your basement waterproofing needs. We are a fully licensed waterproofing company, and we have a wide variety of services to offer. KC Pro can waterproof your wet basement with our ECP waterproofing techniques by installing an interior/exterior waterproofing system, sump pumps, sump basins, vapor barriers, wall crack injections, and crawl space encapsulations. Don’t hesitate to have us come in and take care of your basement waterproofing because we want to help out in any way we can. Servicing the Kansas City surrounding area, we are your reliable team of professionals. We provide free estimates – contact us today! We are your true foundation repair service provider.